Child life coordinator Therese Weisbrot is one of the many members of our pediatric psychosocial support team. At Memorial Sloan Kettering, we understand that it can be overwhelming for a child and family to live with cancer or related diseases. Our experts are skilled in identifying and responding to the various symptoms and possible side effects associated with treatment, including the social and psychological aspects of therapies needed and recovery. Many children have received treatment at Memorial Sloan Kettering for the same disease as your child. You may find it helpful to speak to other patients or families who have had similar experiences. Please feel free to ask your child’s care team to arrange for you to speak with some former patients and their families. We also offer a broad range of support programs designed to help children, family members, and caregivers cope with the range of issues related to life during and after treatment. Cancer can affect children in many ways. At Memorial Sloan Kettering, our pediatric psychosocial care team offers support to our patients and their family members as they deal with a cancer diagnosis, complementing the efforts of our treatment teams. In addition to our work with other experts at Memorial Sloan Kettering, we also enlist the support of outside agencies, programs, and organizations to meet the needs of our families. The Department of Pediatrics at Memorial Sloan Kettering makes our school program a high priority. As one of 40 hospitals participating in a New York City Department of Education program called Hospital Schools, we have several full-time teachers who play an active role in educating our pediatric patients. Our teachers, employed by the New York City Board of Education, help children and teens undergoing cancer treatment maintain their studies and prepare for exams. We work closely with each child’s school and/or home instructor to enable a student to return to class after treatment with little or no loss of educational standing, and to prepare for required tests, including New York State Regents exams, SATs, and GEDs. Child life specialists are trained professionals who are experts in human growth and development. We have a variety of backgrounds and interests including education, psychology, fine arts, and art therapy. We combine our skills and certifications to create comprehensive child life services that educate and empower patients and family members throughout an illness. The goal of our Child Life Program is to help young patients and their families develop strategies for coping with and adjusting to treatment. Children recovering from cancer treatment may need rehabilitation therapy. 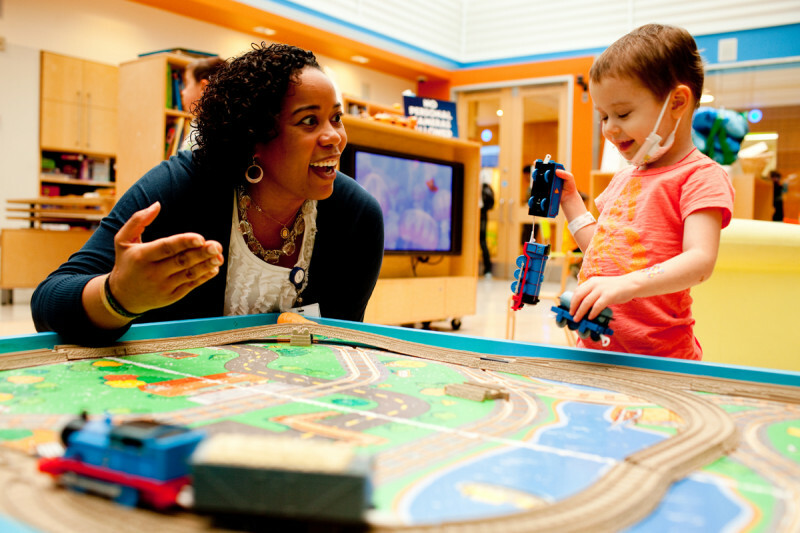 At Memorial Sloan Kettering, our specially trained staff offers both outpatient and inpatient physical and occupational therapies for our pediatric patients. Our child and young adult patients may also benefit from the therapies offered by our Integrative Medicine Service, which complements mainstream medical care by addressing the physical and emotional symptoms associated with cancer and its treatment. We offer music therapy, mind/body therapies, dance and movement therapy, yoga, and other services for our inpatients and outpatients in groups or at the bedside.